WWS features a unique system for registration, so please read this entire section carefully! 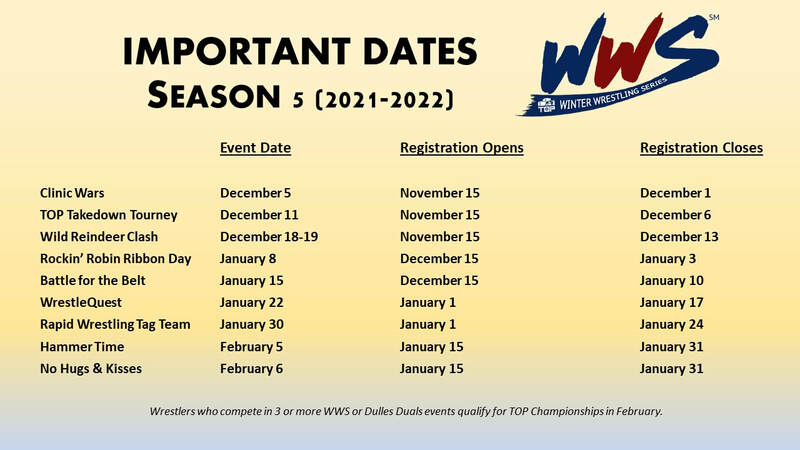 A wrestler must sign up online for each WWS event in order to participate. The registration must be completed before the deadline listed above. Very few exceptions, if any, are made for late registrations. As can be seen above, there is a specific date that Registration opens for each event. It is typically a week or two before the tournament. While it may be more convenient to sign up for all events at one time, we've found this approach significantly decreases "no-shows" at our tournaments. So our system is somewhat similar to checking in for an airplane flight within 24 hours of takeoff. We don't want people registering weeks or months in advance and then forgetting about it. In short, you sign up for one tournament at a time shortly before the event date. The good news is once you've registered in our system, all contact information is saved and future registrations go quickly. After the Registration Deadline, we immediately start working on brackets for the event. Wrestlers are paired up by weight (Madison System, meaning you don't have to make a certain weight, you simply wrestle others around the same weight) and experience levels (rookies wrestle other rookies, whenever possible, unless it becomes clear they need to "bump up" to be sufficiently challenged). Once finalized (usually 2 days before the event), we email a detailed schedule that includes your "time slot" which explains when to arrive. In general, elementary school wrestlers (starting with light weights) begin first in the morning, and middle school wrestlers (ending with heavier weights) wrap up the day. You can generally plan to compete around the same time at the various WWS events, but we never know for sure until brackets are finalized. So you must be prepared to be somewhat flexible. After "time slots" are announced, wrestlers occasionally must drop out of an event. Cancellations should be rare and only caused by truly unexpected circumstances (e.g., sudden illness, injury, family emergency). In short, if you register, you are expected to be there and wrestle. If you truly can't make it, please notify us as ASAP so we can readjust brackets in advance. We also send text reminders the day before the event. Finally, it's critical for wrestlers to show up on time. If they are late, it's highly likely they will be scratched since brackets will have been redone. Warning: Wrestlers who fail to show up (or come late) and don't bother to inform us in advance receive a one-time warning. If it happens again, they are disqualified from participating in future events. We're sorry if this sound harsh, but it's essential to running efficient events. Other families are adversely affected when a wrestler does not show up, so we draw a hard line on this. So, please, inform us in advance if a wrestler truly can't make it. We will not issue an official warning if notice is provided more than 2 hours before the start of your time slot. But always give as much notice as possible. Numerous clubs/teams pay for their wrestlers to participate in WWS events. They will buy their wrestlers a Season Pass ($65 discounted team rate) to attend all events, or choose the Pay-As-You-Go option (discounted team rates are available for this, too). If your team is interested in group rates, contact Tom Houck to discuss. In the above cases, TOP provides the team with a coupon code for families to use when registering. These codes are distributed throughout the season shortly before registration opens for each event. Eligible wrestlers can register for any or all WWS events (just be sure your team isn't paying the fees---we do not issue refunds). Fees for individual events are $19; however, a Season Pass for all six events is only $75. If you purchase a Season Pass, we send you coupon codes prior to the tournaments so you can register at no charge (i.e., you must sign up for every event you plan to attend). If you want to purchase an individual Season Pass, click here.